"I walk and bicycle along paths that hug the seashore, searching for wonders, and I’m seldom disappointed. I may see waves crashing onto a rocky coast or a stalwart lighthouse standing as a lonely sentinel on the shore. 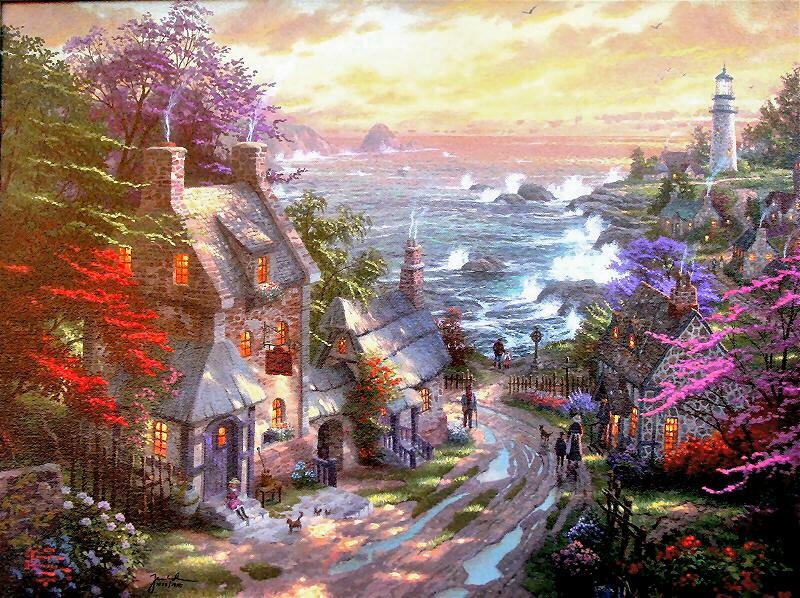 I often discover a quaint little village nestled snugly among the cliffs. The Village Lighthouse portrays one such discovery I made on a seaside stroll in England.The town mirrors the shore in many ways; the stalwart cottages are built of the same granite that rises in cliffs from the sea.The ancient public house in the village offers shelter, as does the lighthouse that stands so proudly on the distant headland. 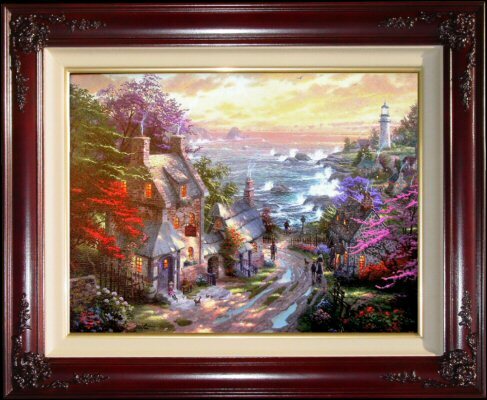 A radiant glow of sun-light bathes the village, touching the magnificent flowering dogwood and lavish stands of foxgloves and impatiens with light, just as it illuminates the waves that dance over the face of the ocean. Seagulls soar over land and sea.Wisps of spray rise from the waves as plumes of smoke ascend from the chimneys. Land and sea, man and nature are in perfect harmony here. If you are in harmony with this scene, you may even sense the rise and fall of waves, and smell the salt sea air."